IT’S A BOY! And we are so excited to finally share this news with y’all! We did not do a big gender reveal party or anything to find out last fall, but instead just wanted to find out together, just the two of us. I can’t even believe we will be meeting him this month!! 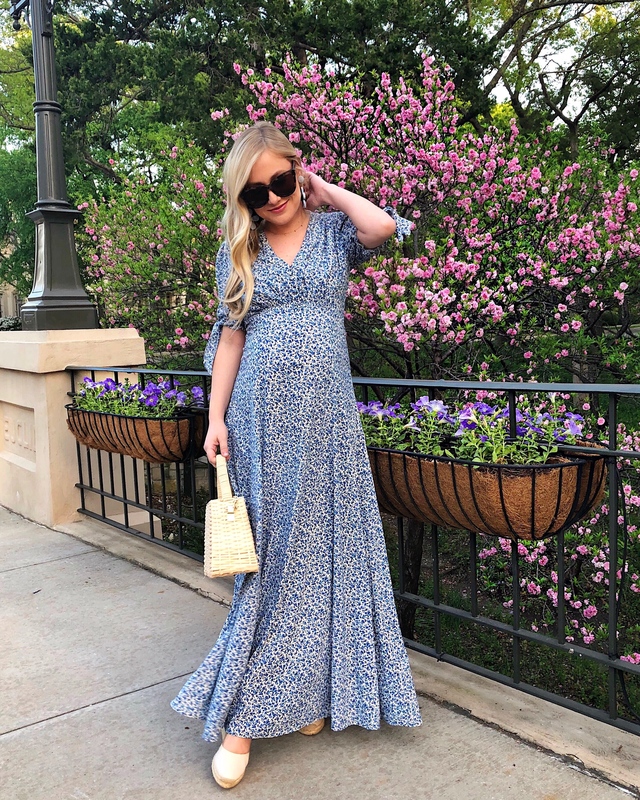 I wore this beautiful blue floral dress by Gal Meets Glam Collection to my second baby shower and absolutely love it. Not only is it comfortable and breathable, it’s easy to walk around with, great with or without a bump, and fitting for so many occasions. Oh, and it also comes in pink! Wear this dress on the weekend with sandals (like these!) or with wedges, like I have on here. Speaking of these wedges, I can’t emphasize enough how comfortable they are! Towards the end of my pregnancy, I haven’t loved getting dressed up. It’s been a challenge finding pieces that make me feel myself. This dress has truly made me feel confident, which has been a struggle. While I’m a bit limited as to what I can wear at this stage, I do have my eyes on a number of other Gal Meets Glam Collection dress like this one, this one, and this amazing jumpsuit. Previous Post Sunday Sale Finds! You look fantastic, and you have found some great maternity styles to wear! Just beautiful!